Today marks the last stop of my blog book tour with a Q&A with Vickie Howell. She asked me some questions about how working on Adorn mag influenced the Crochet Adorned the book, tips for working with jersey, and more. Check it out and enter to win a free copy!! I jammed as much fabric, yarn, buttons and beads as I could in there. 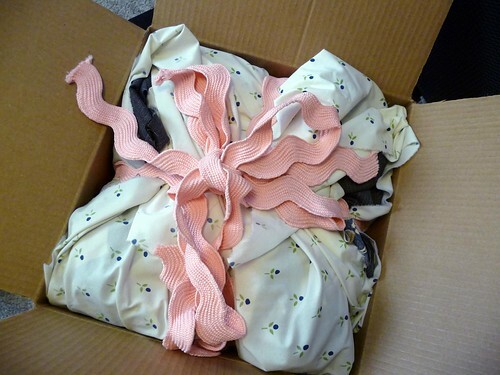 The box was a flat rate box that ships for $13.95, check out the project and fill yours today! And now, I’m going to go bury myself in work and take a breather from the blog. I’ll be back soon with some fun things to show you. Thanks for the tip on IBOL. I'm definitely getting one, maybe even two put together from my stash. And I tried to win a copy of your book, too- but I think I'm going to have to buy it if I don't win it, there is a lot I'm excited to try! Thank you for this great tip. Imagine, de-stashing with no guilt!!! This will be a great place to send all those stacks of fabric I have not used or touched in more than a year. What a great idea! It is so nice to give excess to someone you know will love it and use it. Hope you have a great weekend!